Google knows how important security is. The bread and butter of Google’s business is it’s online search platform, and the reason why Google.com came on top of Yahoo, Altavista and MSN for your online searching needs was relevance. Google’s algorithm is designed in a way that it will show you the most relevant results from your search, that is why, today, you can search for entire questions or phrases and Google will present to you with the best websites that match to your search. In the middle of this is you, the user, that got used to go to Google to find everything you need online however with an increasing number of hackers and malware lurking around online, the concern with security also increased exponentially, and now, Google sees as part of what makes a website relevant is its security. Websites that are safe for their users will not only show that green padlock that indicates how secure it is, but will also show first on Google searches, and that’s where a security certificate on a website is turning out to be an essential part of any respectable website from now on. It will give your visitors the piece of mind that your website is secure, but will also show Google how serious you are about your website, and how concerned you are about security. Undoubtedly, Google loves its users and therefore, is coming up with every possible way to make us feel secure here on the internet. With its recent announcement, in earlier 2017, Google will flag all the unencrypted internet by the end of 2017. This means Google will actually flag 2/3rd of the web as unsafe. With Chrome version 62 being released, websites with any kind of text input will need an SSL certificate. Does your website takes text inputs in the form of login panels, contact forms, search bars, etc? Is your website on HTTP://? If it’s a YES to both these questions, you need to install SSL to avoid any risks or warnings. If you don’t implement SSL soon, your visitors will see a “Not Secure” warning on visiting your site, and that might be just the begginning. If you have a Google AdWords account for your Pay-Per-Click campaigns on Google search, Google may soon require you to have that SSL in order to be able to show your ads on their platform. Entire parts of the internet may follow suit, and block access to websites that do not have a SSL certificate. Yes, it’s that serious! 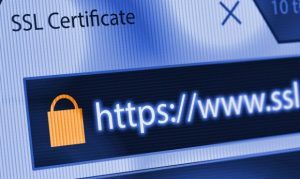 Now, what is a SSL Certificate after all? And How it Works? The SSL is your “electronic passport”! SSL (Secure Sockets Layer) is the standard security technology for establishing an encrypted link between a web server and a browser. This link ensures that all data passed between the web server and browsers remain private and integral. Data such as login credentials on a banking website, an e-mail subscription form, a contact form, a search bar or a payment system. If it has a field where you fill out information and submit it, and you don’t have SSL, it’s vulnerable, and hackers can intercept that information. Undertand this: Cybercriminals are VERY clever! According to Cybersecurity Ventures, cybersecurity damages will cost the world over $6 trillion annually by 2021. It is impossible to escape the rising tide of cybercrime if your website doesn’t have an SSL certificate. They will identify weakness(es) in your network…mostly, when information is transmitted. Recently, the black eye masked people have been refining malicious strains that are specifically designed to capture data while moving between destinations. With SSL certificates, your customers will see visuals like lock icon and green address bar that indicates well-trusted encryption is in use. Well, if I as a customer will see that on your website, I will be assured that my information is traveling safe and not a the mercy of a bad-intentionally individual. Undoubtedly, this will add brand power and boost the credibility of the brand in question. If you don’t have a SSL certificate. Get one now! It’s cost is meaningless compared to the piece of mind it provides you and your visitors. It will improve the credibility of your website and your brand. If you host your website with us, we can install one for you today! If you don’t host it with us, we can help you secure the correct type of SSL for your website and adjust your website to take it correctly, but don’t wait! Contact us today so we can assist you immediately. Don’t waste your time! Order SSL Right now! Word on the street is that Google will roll out this update on the first days of July! Avoid having your site marked as “not secured”. This will damage the reputation of your site. Use our system to order your SSL with a $75 discount until June 30th, 2018! Only $150 for a year, per domain!